Head of South Africa's third largest party hits Trump's call to monitor attacks on white farmers, says Jews training right-wing snipers. A South African lawmaker and populist leader has accused a group of South African Jews of planning sniper attacks against his supporters over a planned constitutional amendment which would permit the government to confiscate property from white farmers without compensation. On Thursday, MP Julius Malema accused “Jews in Pretoria” of training “white right-wingers” for sniper attacks against members of his party. 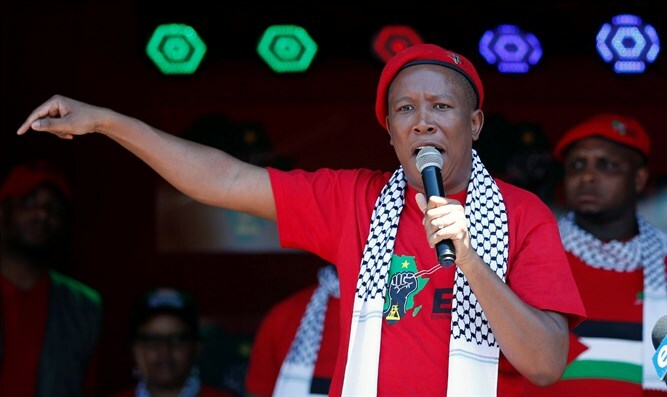 Malema, who heads the Economic Freedom Fighters, South Africa’s third largest political party, claimed Pretorian Jews were planning the attacks over his party’s support for a controversial land expropriation policy aimed primarily at white South African farmers. Malema was responding in part to recent comments by President Donald Trump, calling for closer scrutiny of plans by the South African government to legalize land confiscation without compensation. Known for his far-left positions on both domestic and foreign policy, Malema last year threatened to “occupy” the Israeli embassy in Pretoria. On Thursday, President Trump tweeted that he had instructed Secretary of State Mike Pompeo to “closely study” claims that murders of white farmers in South Africa have been on the rise, as well as plans by the South African government to alter the country’s constitution in order to confiscate land from white farmers without compensation. “I have asked Secretary of State @SecPompeo to closely study the South Africa land and farm seizures and expropriations and the large scale killing of farmers,” Trump wrote. The tweet quickly drew condemnation from not only the South African government, but from left-leaning pundits, American news outlets, and even the Anti-Defamation League, which accused the president of trafficking in fringe-right theories. “South Africa totally rejects this narrow perception which only seeks to divide our nation and reminds us of our colonial past,” the South African government tweeted. Critics of the president’s tweet pointed to data collected by AgriSA – an organization of South African farmers – which said that the overall number of number of farmers murdered was at a 20-year low, though the numbers of murders were not broken down by race. The South African government claims the confiscation scheme would only target land not currently in use, and would help the country better develop its land resources and achieve greater equality. White South Africans, who make up less than 9% of the country, own more than 70% of all farm land, AgriSA claimed in 2017. An article by left-leaning The Daily Beast ridiculed criticism of the proposal, noting that the amendment would not explicitly target whites, and could potentially be used to expropriate land owned by blacks. In justifying the policy, Ramaphosa noted that 72% of farm land is owned by whites, adding that a more “equitable” allocation of property and “patterns of land ownership” were critical to the country’s development.